The most expensive film ever made at the time of its release, 1995’s sci-fi-action epic Waterworld is one of the only Hollywood movies to feature an opening scene wherein a major Hollywood star drinks his own urine! That said, the film has also thrilled audiences through the years with its awe-inspiring action scenes, gargantuan maritime sets and ground-breaking special effects. A definitive post-apocalypse blockbuster, Waterworld stars Kevin Costner (Molly’s Game, Draft Day) as The Mariner – a mutant trader, adrift in a dystopian future where the polar icecaps have melted and the Earth is submerged under water. Those who lived have adapted to a new world of survival on boats and in ramshackle floating cities. The Mariner becomes embroiled with the Smokers, a gang of pirates who, led by villainous leader Deacon (Dennis Hopper, Blue Velvet), are seeking Enola (Tina Majorino, Napoleon Dynamite), a girl with a map to the mythical realm of “Dryland” tattooed on her back. 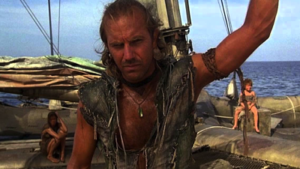 Famous for both its epic scale and the controversy that swirled around its production, Waterworld is a key cult film of the 1990s, and an essential entry into the subgenre of ecologically-minded blockbusters.